I let my character guide me. I have a favorite quote for that actually. I found it on facebook it says "I create the character then I take dictation." Hmmm.. That's a good question. I guess the answer would be I act out the dialog that helps me get into the frame of mind. Yes, I can't write without listening to music. Hmmm for emotional scenes my favorite song would be Heartland by a group called Celtic Thunder. 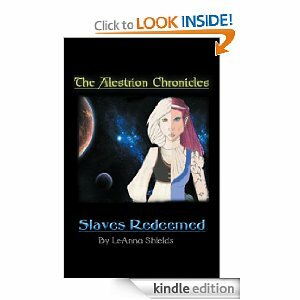 The Alestrion Chronicles: Slaves Redeemed is my first published book, and it's the first in a series. I'm currently working on books 2 and 3 in the series along with a steampunk novel. My favorite book is definitely The Lion, The Witch, and The Wardrobe by C.S. Lewis. I love his use of mythology and symbolism. Born Yesterday filmed in the 1950's. It's one of my favorite movies. I'd have to say I have two and for two different reasons 1st is Aria I love the way she grows and matures throughout the book. 2nd is Raychor I love his loyalty. My favorite word is "grace"
Least favorite word has to be any of the 4 letter words and no I'm not typing them out. The sound of a dentist drill. one I recently made up for my second book cricus. I believe that heaven exists, and I want to hear God say one day, "Well done good and faithful one."